Rejštejn came to existence thanks to gold panning and gold mining. Originally, this was a small, independent settlement which in 1584 was elevated to a town. In the 17th century the town was saved from an economic decay caused by the slow down in the wood mining industry by the boom in the glass making industry. First, delicate glass pearls were manufactured here, later they started producing window panes. 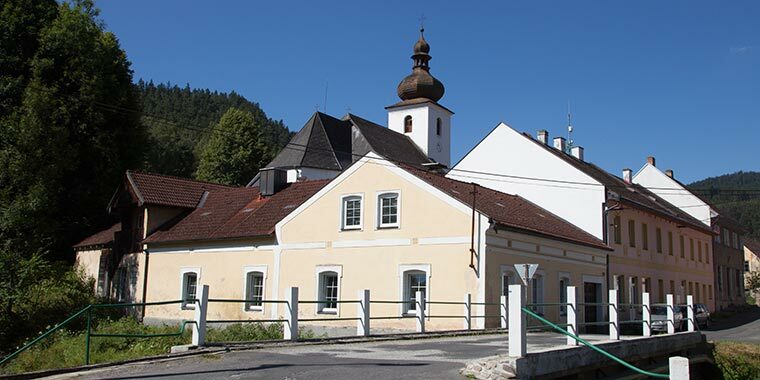 The town became famous thanks to the glass making factory in Klášterský Mlýn which was producing crystal glass that was exported into the whole world. It is possible to see samples of their work in the Museum in Kašperské Hory (ca 4 km). 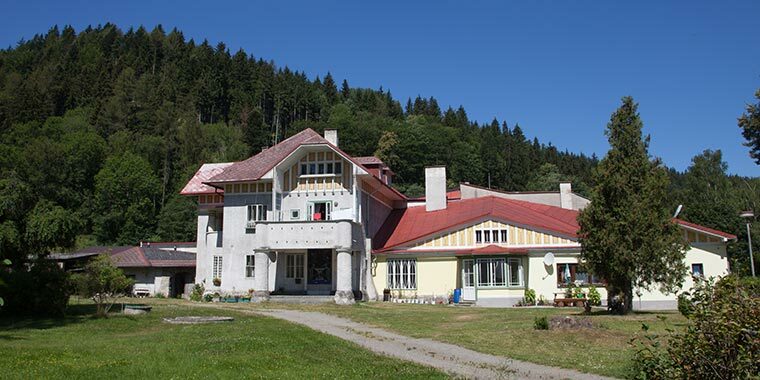 In Klášterský Mlýn one can see the Art Nouveau villa of the glass manufacturer M Spaun. Apart from the glass making industry, the local inhabitants found work in the nearby factory of Franz Watzlavick which was manufacturing prams, or they were working in the forests processing wood. The main feature of Rejštejn is the Church of St Bartoloměj mentioned in 1570. The Church was rebuilt in 1792. The local cemetery became the final resting place for the mother and brother of the famous Šumava writer Karel Klostermann (Charlotta Klostermannová + 1903, Jakub Klostermann + 1901) who used to come to Rejštejn. Several of his novels and stories take place in the town and its surroundings. A boulder with bowl-like hollows from mediaeval processing plants for gold bearing silica is located in the square near the information board. The hollows were used for grinding gold bearing silica with mercury to extract pure gold. The village has very good bus connections to Sušice, Srní and Modrava and ski centres in winter. In summer tourists explore the various marked walking and cycling routes. Southwest from the village there is the rocky peak of Meierstejn offering lovely views over the countryside. The former pub for raftsmen ´K Myším Domkům´ can be reached after a two-kilometre walk along the red marked path. 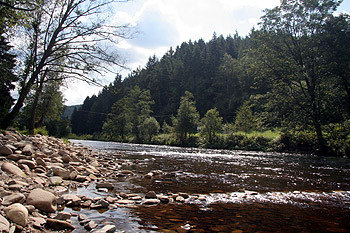 If we continue for approx 4 more kilometres, we will get to Čeňkova Pila above the conflux of the Křemelná and Vydra rivers which gives ´birth´ to the river Otava. 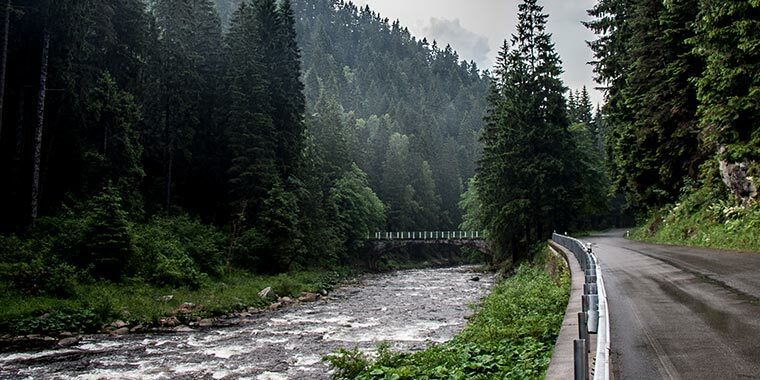 You might like to visit the exhibition of the water power plant ˇŠumava Energy´ or walk along the Povydří nature trail. 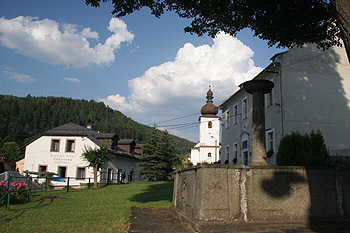 Northwest of Rejštejn there is the Klostermann Peak with a chapel, the so-called Klapperl. There are many lovely walks in the neighbourhood, e.g. 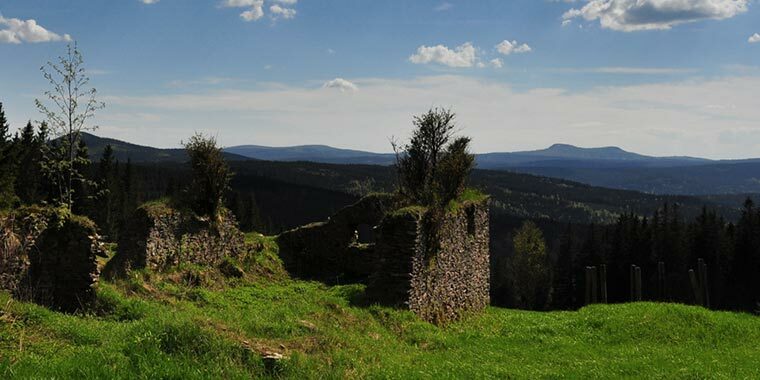 along the Otava valley or the Losenice and Zlatý stream valleys with the remnants of mediaeval gold mines. Several cycling paths cross the village, such as no. 331 Sušice – Kvilda or 2087 connecting Hartmanice with Kašperské Hory.